Wednesday brings us Day Two of my Superhero ABCs. I don't think any superhero has defined the genre more than the Dark Knight. He's been on the top of the world in every medium, from movies to TV to videogames. Everybody knows something about the cape & cowl, whether it's the Bat-Signal, Commissioner Gordon, or Robin. One of the characters in my book is loosely based on the Caped Crusader. He's called the Crusading Comet, and in the world of I, Crimsonstreak, he's a hero who takes himself a little too seriously at times. You really can't have a great superhero story without making a few nods to Batman. He's got a fantastic origin story, his costume (Crimsonstreak would kill me for failing to call it a "uniform") is spot-on, and he boasts the best gallery of rogues in all of superherodom. His supporting characters are equally memorable. Batman is a flawed character, a vigilante so hellbent on dispensing justice that he sometimes forgets the reason he's doing all this. I don't mean he forgets the dark night when his mother and father were murdered; I mean Batman sometimes fails to embrace his own humanity in his single-minded quest to stop crime. He's so obsessed with ridding the streets of grime and corruption that he overlooks the qualities and foibles that make us human. 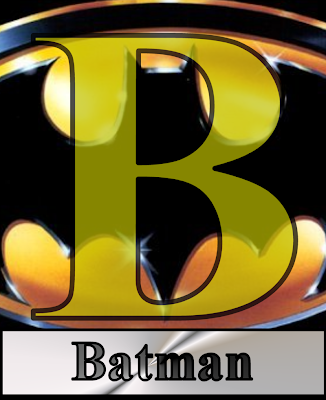 This Batman persona is him, while his "real identity" (Bruce Wayne) is more of a mask than anything else. Batman is also a flexible character. He can be the one-man army. He can be the detective who tracks down a mystery. He can be the nightmare lurking in the shadows. He can be the swinging-from-the-rooftop type. And, when Adam West is involved, he can be the greatest superhero parody in comic book lore. Tomorrow: The Star-Spangled Man with a Plan! A is for The Avengers!